Onkyo's flagship home cinema package is a THX-certified monster, perfectly combining a 7.1 channel networked AV receiver with Dolby Atmos speaker package. Earn 1089 loyalty points when you order this item. Onkyo HT-S9800THX combines an AV Receiver and 5.1 Speakers conveying a cinema-grade experience from the comfort of your own home complete with Dolby Atmos and DTS:X reproduction. Dual-band Wi-Fi funds FireConnect motorised by Blackfire for multi-room audio distribution, Chromecast integrated and DTS Play-Fi. Transmit wireless music from Spotify, AirPlay, and Bluetooth technology to speakers rapidly. Featuring HDMI pass-through for Dolby Vision, HLG, HDR10 and BT.2020, this system is built to accommodate evolving technology. This 2-Way speaker set features concrete MDF housing and A-OMF woofers (containing layered polyethylene naphthalate and malleable cotton texture). Built-in 2-way Mount speakers with 13cm A-OMF drivers pledge life-sized frame. Front-firing sub fixed with a 30cm cone yields 125W of chest-rumbling bass. All speakers are qualified to meet THX Cohesive System values. The high-current aptitude of Dynamic Audio Amplification is demonstrated by an capacity to drive four-ohm speaker loads, which rigorously test the sturdiest amplifier. Loads of muscle translates to greater control, reinstating energy to high-fidelity and multichannel sound. Furthermore, VLSC disregards pulse-noise for ideal reproduction of superior audio sources. Object-based recordings permit freely assorted sound to play over any speaker in your scheme, stirring above and about you for an immersive film or gaming knowledge. 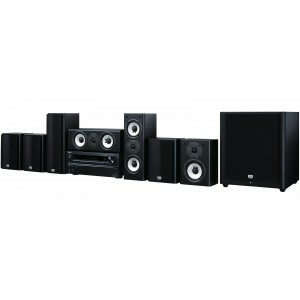 The HT-S9800THX replicates 5.2.2 surround audio Atmos or DTS:X formats in which the wall-mountable surround speakers, included in this package, work to credibly recreate sound effects overhead. Onkyo Controller, incorporating next generation network audio, amasses streaming services and resident network auditory into an innate app. Control playback, travel facilities and allocate audio all over your home with FireConnect driven by Blackfire from one line. Stream any music from your smartphone, laptop or PC to the HT-S9800THX effortlessly. Control reproduction with your favourite Chromecast-enabled apps from iPhone, iPad, Android phone or tablet, Mac or Windows laptop or Chromebook. DTS Play-Fi is a convention that functions with any audio app on mobiles and PC. Skim whatever’s streaming to the receiver, even varied sources to diverse modules simultaeously. Chosen 5 GHz/2.4 GHz Wi-Fi promises a steady assembly so you can stream over AirPlay, the Spotify app, and home network. Bluetooth wireless technology offers guileless streaming from your choice of app. TIDAL, Deezer and TuneIn are involved to make choosing from a huge range of music and radio programs using Onkyo Controller very modest. FireConnect reflects network audio and exterior analogue sources linked to a chief component from streaming facilities to vinyl records on FireConnect-compatible speakers in other rooms. Music collection, speaker alliance, and playback management through the home are constructed into Onkyo Regulator app for iOS and Android. Six back HDMI inputs and Main Out support pass-through of HDR10 and Dolby Vision; HLG (Hybrid Log-Gamma), and BT.2020; 4K/60 Hz video; and HDCP 2.2 for top video playback. Front HDMI input bids a tranquil link to a video camera, while Sub Out is idyllic for projector association. Powered Zone 2 speaker outputs allow you to send augmented network, S/PDIF and analogue audio bases to a pair of speakers in an alternative room. Govern playback using Onkyo Controller.